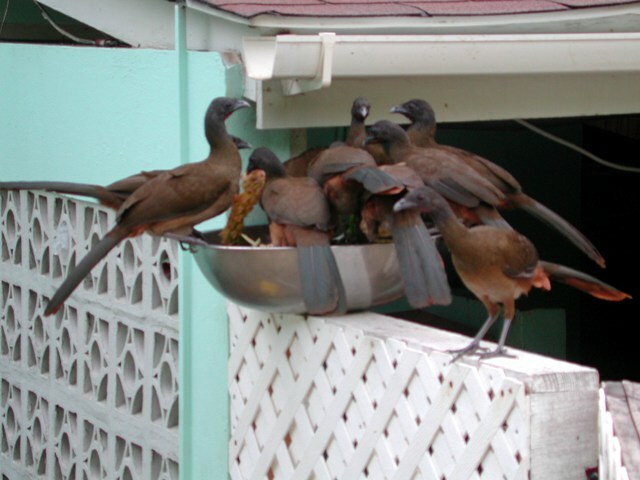 Oilbirds, tropicbirds, motmots, trogons, antbirds, bellbirds. The list of tropical exotics could go on and on. All can be seen up close and personal when visiting the islands of Trinidad and Tobago. 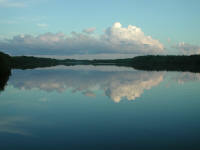 This island nation is just off the northeastern coast of South America, near Venezuela. 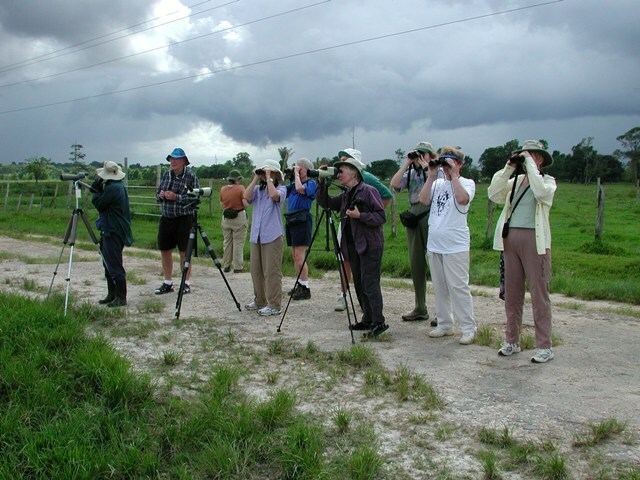 In November 2004, The Carolina Bird Club sponsored a ten-day trip to those magic isles. 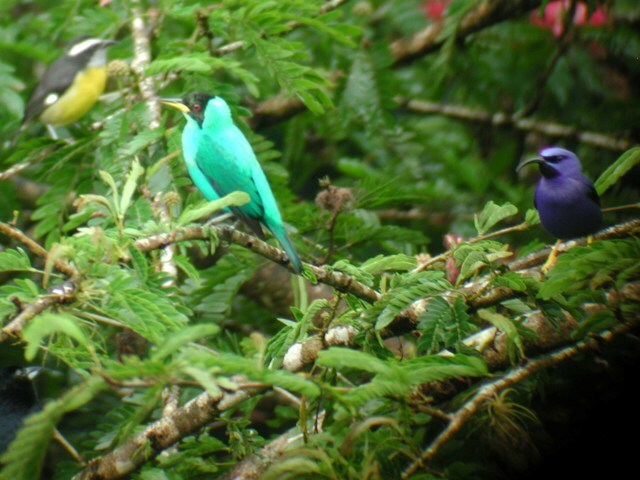 It was a trip to a birder's heaven. Simon Thompson, owner of Ventures, Inc., was the nonpareil group leader assisted by locals on the scene. Twelve hardy birders rounded out the Carolina contingency. 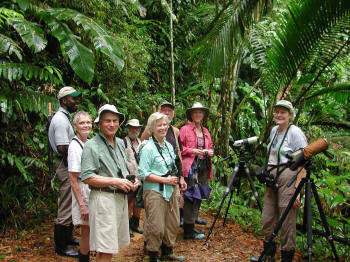 On Trinidad our base was the Asa Wright Nature Centre at 1,200 feet above the Arima Valley. We walked the trails on the Centre grounds and took van excursions to explore an incredible variety of habitats in the valley and on the coast. The verandah at Asa Wright is a destination in itself. 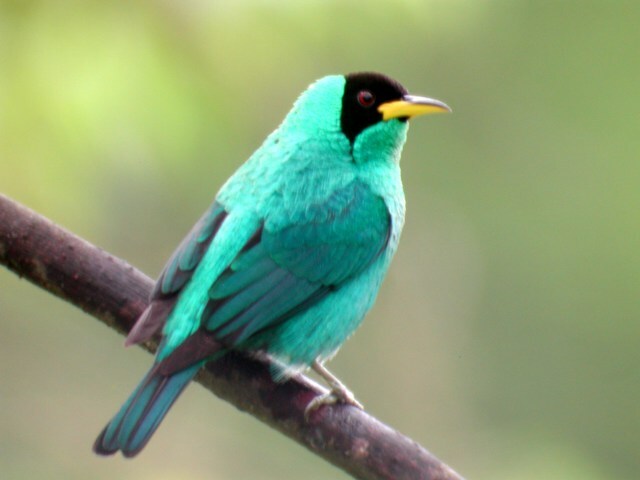 Surrounded by hummingbird feeders and overlooking fruit and bread-laden feeders on the ground, it is not unusual to have 20 or more species in view at any time of day. 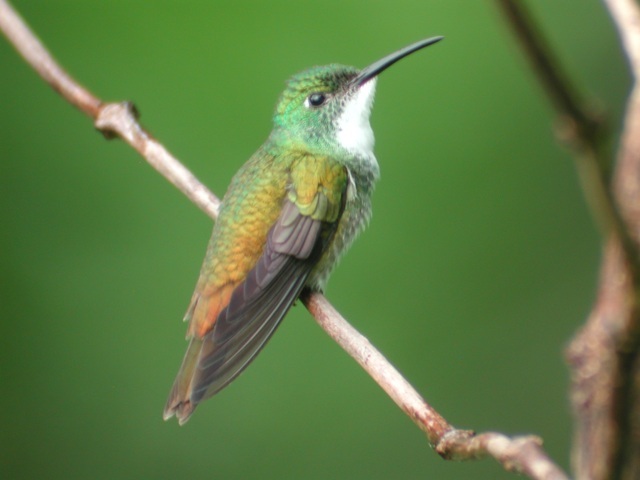 It is common to have six or more species of hummingbirds, along with Bananaquits and honeycreepers, vying for space at the feeders. 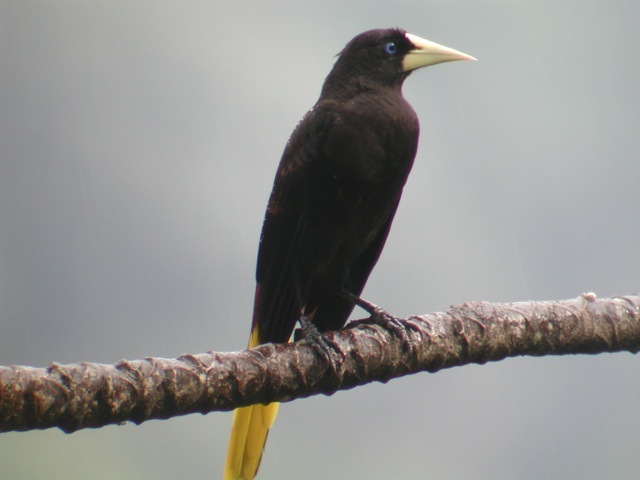 Another dozen species are on the ground including Bare-eyed Thrush, Ruddy Ground-Dove, Crested Oropendola, and several tanager species. Palm Tanagers are nesting on the porch. Several in our group had 25 lifers before breakfast! The helpful staff was always available and had scopes at the ready to show a distant Ornate Hawk-Eagle or Double-toothed Kite. Asa Wright has a special place on its grounds: Dunstan Cave, one of the most accessible sites in the world to see Oilbirds. 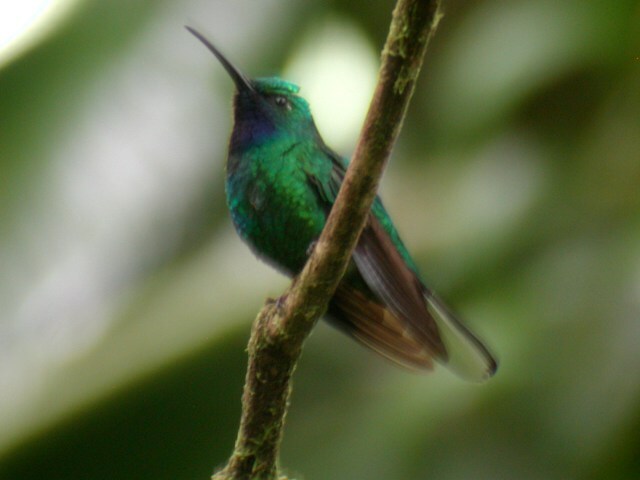 These large-with a wingspan of 3.5 feet-nocturnal fruit-eaters roost there. This bird leaves the roost at dusk and, navigating by a sort of sonar, finds his food by smell and hovers over the fruit to eat it. One afternoon we traveled to another special place, Caroni Swamp, a large mangrove swamp on the west coast of Trinidad. We got into a powerboat to travel the few miles to one of the most spectacular sights of the whole trip. 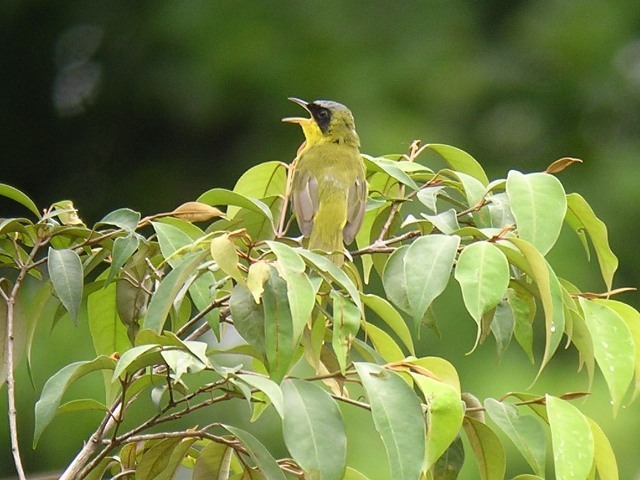 On the way Green-throated Mango and Red-capped Cardinal were seen. And our boat passed under at least one Trinidad Red Tail Boa Constrictor. Toward dusk they began arriving. First in small numbers, twos, and threes. Then the numbers expanded until it seemed the whole sky was full of flapping scarlet. 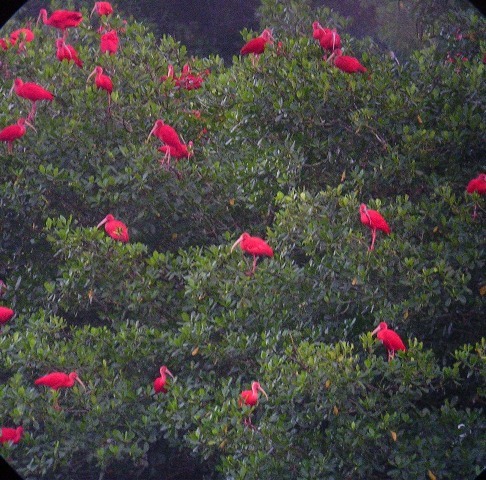 Hundreds, thousands of Scarlet Ibis were coming to an island in a Caroni Swamp lake. 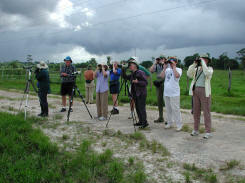 The ibis were joined by hundreds of Tricolored Herons that roost on the same island. Tobago was only a short flight away. 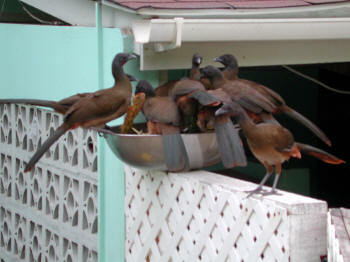 Unfortunately, severe rainstorms just before our arrival hit Tobago, which was recovering from hurricane Ivan. Mudslides throughout the eastern part of the island were very serious and presented a major obstacle to travel by foot and by vehicle. The Blue Water Inn, on the northeast tip of the island, was our base. We found Blue-crowned Motmots roosted on the lights of some of the rooms' balconies. From the Inn it was just a short boat ride to Little Tobago Island to see nesting Red-billed Tropicbird and Red-footed Booby. 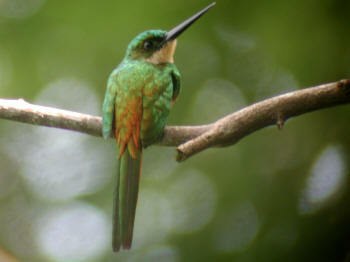 At Bon Accord lagoon we had good views of Little Egret as well as Blue-black Grassquit and Red-crowned Woodpecker. A couple of days later, in Gilpin Trace in the Main Ridge Forest Preserve we saw White-tailed Sabrewing and Collared Trogon. On the last night we tallied up the trip totals and came up with 198 species. Two more were added the next morning at a brief stop on the way to the airport: Ring-necked Duck and Green Heron. Grand total: 200! Thanks to the Carolina Bird Club for its sponsorship of these extralimital trips!